The coolest thing about the new fourth-generation Apple TV is its Siri-powered search function. Not only does it look through a variety of apps to instantly find a specific film or TV show, but it saves you from the toil of typing in a search term. You can narrow your searches using certain criteria, or even check the weather, stocks, sports scores, and more. In this article, we'll teach you how to sweet-talk Siri into going the extra mile. First, make sure Siri is turned on in Settings > General. The feature should be active by default, but it won't work if your selected language and country aren't supported. You can find your language and region format in Settings > General, and your location can be checked and changed in Settings > Accounts > iTunes and App Store. 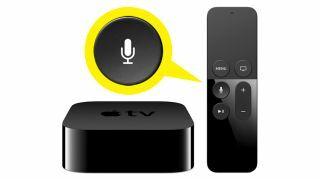 If everything is set up properly, Siri is a breeze to use: simply hold down the microphone button on your Apple TV remote, tell her what you want, then release the button. She'll have your results in a jiffy. With so much stuff to sort through, it helps to have Siri on your side. In the US, Siri can search for movies and TV shows in iTunes, HBO Go, HBO NOW, Hulu, Netflix, Showtime, and Showtime Anywhere. In the UK and Australia, Siri can search for movies and TV shows in the iTunes Store and Netflix. You can also ask Siri to launch any app, or to find a specific app in the App Store. With the Apple tvOS 9.1 update, Siri even supports Apple Music. Simply ask Siri for what you want (ex: "I want to watch The LEGO Movie"). If more than one item fits your criteria, Siri will let you pick; if there's no question what you're looking for, she'll play the content straight away. You can even specify which app to search ("Find The LEGO Movie on HBO"), or ask for a certain season ("Show me season five of The Walking Dead"). If you don't have anything specific in mind, try searching by genre, cast, director, rating, popularity, or the period in which a film or show was released. For example, you could tell Siri to "Find kids' movies," or to "Find popular kids' movies," or to "Find popular kids' movies starring Robin Williams," or to "find popular kids' movies starring Robin Williams that came out in the 90s," which will get you Aladdin, Mrs. Doubtfire, Jumanji, and others. If you know what you want but can't remember the title, you could, for example, ask Siri to "Find movies starring Brad Pitt and Angelina Jolie" as a way to track down Mr. & Mrs. Smith. After Siri delivers your results, you can narrow your search with additional criteria. You could say, "Only the good ones," "Just the ones released this year," "Only the ones from the '80s," or "Only action movies." Or if you're in a B-movie mood, maybe ask Siri to "Show me bad Superman movies," which correctly results in Superman III (in which the Man of Steel faces a sentient computer built by Richard Pryor) and Superman IV: The Quest for Peace (which has Lois Lane inexplicably walk and talk on the moon sans spacesuit). Once your chosen movie or TV show is playing, you can tell Siri to "fast-forward 10 minutes," or to "turn on Closed Captioning." If you miss a bit of dialogue, you can ask "What did he say?" and Siri will jump back a few seconds and temporarily turn on Closed Captioning. Or if you want more info on what you're watching, you can ask "Who stars in this," "Who directed this," or "When did this movie come out?" "When's the sunset in Paris?" "Who's winning the Warriors game?" "When do the 49ers play?" "Who leads the Western Conference in the NBA?" "So far this season in the NFL, who's thrown for the most yards?" "Who won the World Cup?" "Who's the starting pitcher for the San Francisco Giants?" If Siri on Apple TV is like Siri on iPhone, she'll constantly get smarter with updates from Apple, and she'll have a few surprises built in. For example, I told her to "Show me the money," and up popped Jerry Maguire with the comment, "Hmm, where have I heard that before?" I tried "May the Force be with you," and she said it sounded "like I might be looking for" Star Wars. "I'll be back" triggered The Terminator. It pays to play around a little, so have fun getting to know your new best friend.